La Colonica is a completely private house in the grounds of an old and very beautiful ex-farmhouse. It is the perfect base to visit Florence, Siena, Chianti, and the hill and wine towns of Tuscany and nearby Umbria like Assisi and Perugia; itineraries provided. It is comfortable and welcoming. Ideal for groups of up to 4 adults (families of up to 5). La Colonica has 2 large very comfortable bedrooms (one with four-poster bed) with en-suite bathrooms. Large living and dining areas, open wood-burning fireplace; Dining room; Kitchen. Panoramic dining patio. Very well furnished; fully equipped. The house is totally self-contained and private in a lovely Garden setting; not overlooked. It has beamed ceilings, terracotta floors, and marble bathrooms. Fully air-conditioned throughout. High-speed Wi-Fi internet. Free GPS (Sat-Nav), laptop computer, and Italian cell phone. La Colonica is in the heart of the beautiful Val di Chiana countryside in Southern Tuscany near Cortona, Monte San Savino, Lucignano, Arezzo. 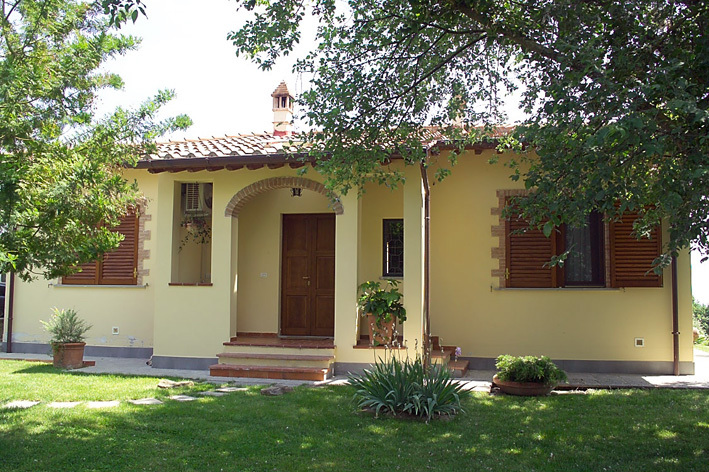 The house is surrounded by large (2.5 acres) gardens and olive grove with views of the surrounding hills. Free parking in the grounds. It is a short walk to the nearby pretty medieval village. There are excellent local and reasonably priced restaurants. Swimming pools and thermal spas nearby. Maid service and baby-sitter possible. It is ideal for a relaxing holiday in comfortable and beautiful surroundings. Visit Cortona (made famous by the film Under the Tuscan Sun), Siena (26 miles), Florence (50 miles), Perugia (40 miles), Assisi (50 miles). Rome (112 miles) is 2 hours drive. Discover the medieval hill towns of Southern Tuscany and Umbria; enjoy San Gimignano, Pienza and Lake Trasimeno. Visit Montepulciano, Montalcino (Brunello wine) and the Chianti region and enjoy their famous wines. Or simply enjoy your private garden! Stay in Florence: Stay in our lovely apartments in the historic centre of Florence, Belvedere (sleeps 4/6) or La Pergola (sleeps 2/4).